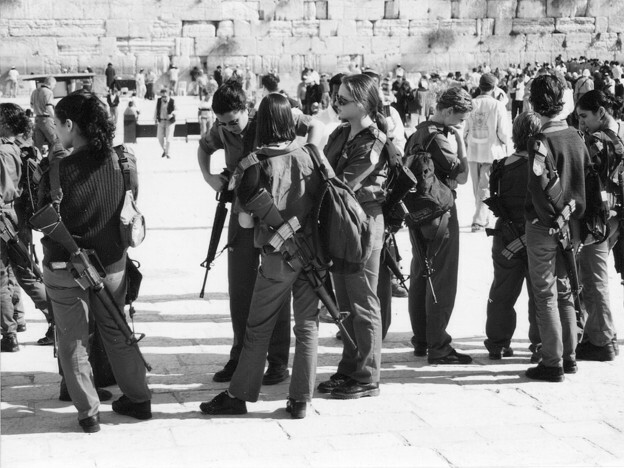 Women soldiers at the Wailing Wall, 1997. Photo: author. This is an ambiguous image. In preparing this entry, I looked at it for some time. Should I post it? I took the picture. It depicts a detachment of Israeli soldiers on security duty in front of the Wailing Wall in Jerusalem. The time is 1997, a time of relatively relaxed tensions. The women are relaxed, at ease, rifles slung across their backs. Sunglasses and hair styles typical of college students in the period. I refused military service in the Vietnam War, just after graduating from Berkeley. Some feminists advocate for the right of women to serve in combat roles. I heard of discos in Tel Aviv with service weapons stacked up at the entry. The Wailing Wall is segregated into male and female zones, with the women's distinctly marginal, subordinate. What are the gender politics in this complex? At what point may I ask that question? On the other side of the material wall is an alternate spiritual order. I caught a glimpse of the Dome of the Rock through the crack between ancient wooden doors of the Arab quarter of the Old City. It seemed like paradise, bodies effortlessly moving in wide space. The Wailing Wall is crowded, pressed, a different order of experience. Incommensurate. What am I doing there? I am not arguing for complexity as a value in its own right. After leaving our conference in Tel Aviv, I was relatively free to move around. I had a friend of a friend in Jaffa to look up, a psychoanalyst recommended by an Israeli artist—Michal Rovner, whose digitized photo of a soldier giving up or falling in space is on the cover of Bad History. This turned out to be a meeting with a remarkable person. Her gesture of welcome was to ask, What are you doing here? What brought you to this place and its complexity, bad history included? She suggested we go to her study for a short session. It is remarkable how psychobiography and psychohistory coincide, diverge. The interchange kept to basics, nothing deep—only a chain of associations concerning past history activated in the present encounter. Our conversation continued upstairs, the living area of a comfortable, three-story building. Conventions of hospitality to travelers were in play—I subscribe to that ancient custom, without question. Travelers are points of contact, giving information, returning with it, interpreting, mediating, sensing the limits of their knowledge as they come to know more. I then heard of a radical sect whose observance was to seek out the most minute particles of flesh from bomb victims as a religious observance. An analytic paper has been written on the phenomenon. Trauma and recovery, psychohistory and materiality. Our conversation was interrupted by a cell phone call from one of her daughters on the Lebanon border. Michal Rovner made a difficult video documenting the same border as a place of questioning, ending with explosions. I may be a guest in your house, but I do not leave my politics at the door. They are a part of the interchange too, a basic underlying assumption of the condition of dialogue. The next day, four of us from the conference—whom I will not name until I have their say so, such is the difficulty of this topic—took a cab to Jerusalem for the day. Two scholars and two poet/critics encountering one garrulous cab driver. It is not a long ride, with a gain in elevation similar to the Berkeley hills. The cab driver knew his history, as far back as immigration in the 30s—no talk of 6000 years from this man. A populist, with some reading, working the trade. His prognosis for the present moment: sooner or later they will have to make their deal, resulting in the two-state solution, it's just a matter of time. Of course, the endless deferral of that moment turns out to be the political alternative to that common sense. Who is the "they" from the perspective of a cab driver: the state, global alignments of power, the arms industry, circulations of finance. It is as simple a perspective as going from point A to point B, which at that moment seemed unimpeded. The history of division as the basic premise of what needs to be addressed. Jerusalem in the present is a divided city, as it has been in the past. How should we approach it? I cannot visit a divided city without entering each of its zones. That may be impossible. In the Arab quarter we were interrupted by a demonstration of school children against the Occupation; marching in uniform, with drum beats and trumpets, adult monitors, armbands, placards. The Armenian quarter is a cypher, remote from the history of the present. The Christian quarter offered a view of the cracked rock of Golgotha and other relics of faith. I took my photographs and noted the well-funded reconstruction of the Jewish quarter. After lunch in the Arab quarter, our party decided to part ways. I would go with the senior critic to the Israel Museum, while the others wanted to go down to occupied Ramallah. The senior critic joked about a split between aesthetics and cultural studies, approving my choice; but I wanted to take in a major exhibition of Soviet realist painting from the 30s, juxtaposed with work from the collectivist kibbutz movement from the same time, so the choice may not have been so obvious. Through several rooms of massive trophies of constructivism and social realism, I put on my decoding lenses and sized up the art of the kibbutz, which looked quite folkish and populist by comparison. But the representational subtleties only bored my companion; it is an enduring image of the trip to see him stretched out full-length on a museum bench, out like a stone. Decoding lenses removed, I had to wonder about my choice to remain within Eurocentric confines and not visit the Occupied zone—but here research opportunities diverged. On return, the others had their tale to tell—and since then, I have regretted my nervousness about the border. Perhaps I did not want to engage my feelings about it by experiencing its existence, and that would extend to the current wall, which I would scarcely want to visit as a tourist. Here the larger question of what I would do, and not do, emerges. I would go the Israel Museum to take in the Dead Sea Scrolls and the post-Soviet diplomacy of a traveling exhibition; I would not validate the border. This leads to the question of what I would do now: would I attend an academic conference on poetics in Israel if invited; would I travel to Occupied Palestine? My answer is affirmative to the latter: I would gladly travel to Occupied Palestine, in order to report on what I saw. I would carefully consider the circumstances and my projected role in any exchange in Israel, without ruling it out but preferring to wait for the two-state solution, should it come. It may be in life I have been overly cautious in terms of where I would go, what I would permit myself to experience, depending on my political tendency and misgivings. I might not have entered the home of that bourgeois, or gone to an opening at that gallery, or chatted up that critic whose views I find to be intolerable, just as I might not step foot in Germany before I was ready to think through its history, nor have I overcome the distance across the Taiwan Straights which was there all along in personal history. It all returns to that moment of refusal, so long ago—and yet one cannot reduce the complexity of lived experience to precisely those terms. I make careful choices about my affiliations, and do not participate in arrangements I believe to be pernicious, or complicitous with oppressive orders, in my understanding. I would join the general strike, should conditions be right, or one targeting a specific injustice, even if not likely to succeed. Objecting to the working conditions of adjuncts or the involuntary servitude of student debt, I would more than put my name on a petition and stick my neck out when it is uncomfortable in certain circumstances (ask my colleagues about that!). Often of course I have no choice̦—as is true of the nature of the state we live in and its confining history. But I would first take that contradiction on myself and my agency before projecting it onto others, to characterize their decisions in circumstances I may not have resolved to act on myself. This is a question of standpoint. There isn't any position outside from which the contradictions we are enmeshed in stand forth with such overwhelming clarity. The dialectic is immanent, in this sense. One works from a given position, in terms of particular choices, guided by an emerging sense—which might at any point be falsified—of their coherence. That is a standard I look for in others' politics. Politics is first of all a self-interrogation, not a download of one's contradictions onto imagined others.